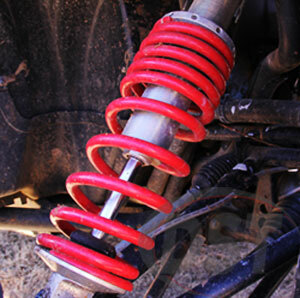 Are you looking to give your RZR a little extra edge out on the trails, without a costly suspension replacement? Well, you’re in the right place. 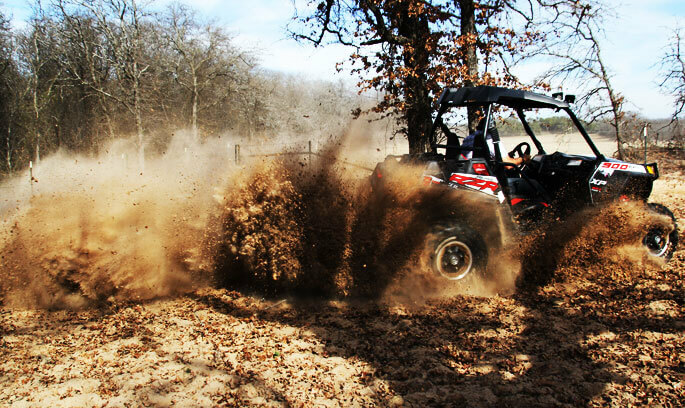 In this article, I am going to tell you why rubber is not a reliable bushing material, the ‘creative’ (yet dangerous) fixes for them, and how longer-lasting polyurethane UTV bushings will save you money and upgrade the suspension of your RZR. The bushings that came on your RZR from the factory are made from rubber, and as you may have noticed rubber will eventually crack, break or deteriorate. The reason the manufacturer chose rubber for your RZR’s bushings is that rubber doesn’t need to be regreased, it doesn’t squeak and it reduces Noise Vibration Harshness (NVH). This sounds pretty good until your shock stop cracks and falls off leaving you with metal on metal contact in your shocks and a less than enjoyable/safe ride. When things break and everyone says there’s no easy fix, it tends to bring out our creative side/inner redneck. For instance, using zip ties to clamp the broken bushings back together or using water hoses in place of bushings. My personal favorite is the use of Kong dog toys as shock stops, very creative not very safe. Some of the more extreme off-road enthusiasts will even take their sway bars off entirely, because of continually failing bushings. While these fixes are nothing short of creative and might sound like a good alternative, they really are not the best option for your RZR. When asked about common problems associated with UTV’s a UTV mechanic of 20 years said the biggest issue he’s seen is when people use things like water hoses for bushings. This makes a simple control arm bushing fix go to a total A-Arm replacement because the water hose was not made to take a beating like your bushings are and in turn, it breaks more things than it fixes. This same principal applies to all the other weird fixes on different bushings. So when you’re out jumping the trails or zooming down the pasture and your bushings break don’t MacGyver your bushings with zip ties and an old garden hose, no matter how much fun it might sound. What’s Polyurethane you ask? Well, polyurethane is a long lasting durable material that is used in making a variety of products like skateboard wheels, bowling balls and most importantly bushings. Polyurethane is impervious to rips, tears, road grime and weather. Additionally poly will last the Lifetime of your RZR, so you can say goodbye to zip ties and give your Kong’s back to Fido. Have you ever been told by a dealership or friends that bushings are not sold separately and you have to replace the whole component to fix the issue? This is NOT true; in fact here at DST we have Power Sport bushings sitting in our warehouse waiting for you. Don’t you think it’s time to stop throwing away money on new suspension parts when all you really need are some replacement polyurethane bushings? Energy Suspension’s Polyurethane Power Sports bushings offer a performance advantage compared to stock bushings. For example, with polyurethane sway bar bushing your RZR’s stock sway bar will perform like a more expensive larger diameter sway bar. What about polyurethane control arm bushings? Yup, you’ll be able to get more contact with the trails especially on those quick turn and help maintain a zero degree camber. The list of benefits goes on and on, but if you want the easiest and most cost-effective way for a suspension upgrade then go straight to the bushings. 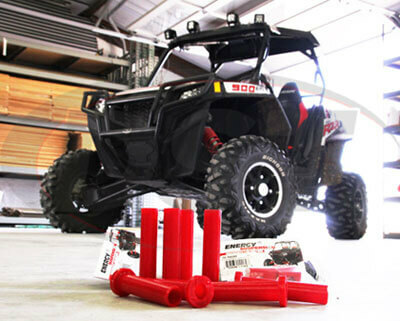 Unlock your RZR’s full potential with Polyurethane Bushings. …don’t MacGyver your bushings with zip ties and an old garden hose, no matter how much fun it might sound. Hopefully, I’ve given you the tools and knowledge needed to make a safe and smart choice for your RZR. 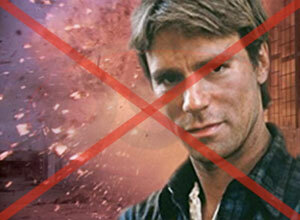 Just remember, your OE rubber bushings are prone to failure. Polyurethane is a stronger longer lasting material that will not only last the lifetime of your vehicle but will also give your RZR a performance advantage. Do you have any odd fixes you’ve used on your RZR? Let us know about it down in comments, like and follow us on Facebook for your chance to be a featured customer!